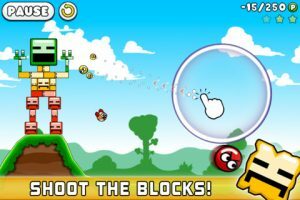 At first blush, Blosics by FDG Entertainment appears to be yet another physics-based block-breaking game in the vein of Boom Blox or Angry Birds. As it turns out, it is almost exactly that. 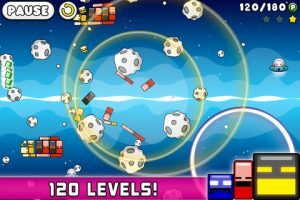 And while Blosics is a perfectly competent and even enjoyable block-breaker, it does little to differentiate itself from the now flooded market of me-too titles. True, the level design in Blosics does take some creative turns, as shown in the screen shots below. But too much time is spent trudging through same-y levels with little character or personality to keep you motivated. Again, there is nothing inherently wrong with Blosics. In fact, it’s a fine game. But its lack of depth, originality, and personality also mean it probably won’t be the next mega-hit on the App Store. In Blosics, the objective is to clear enough blocks from the screen to clear the level. There are one, two, and three-star goals for you and, as found in countless iOS games, collecting these stars will help you earn access to items and episodes. As you might guess, there are different kinds of blocks and different kinds of balls with which to clear the blocks. 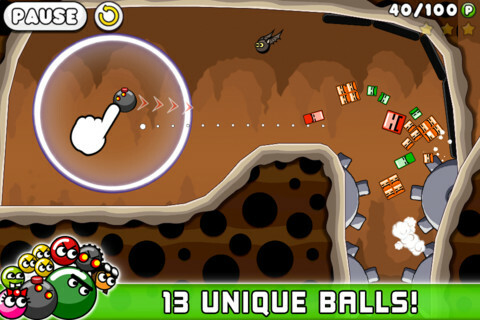 Thirteen different balls in all can be unlocked either through in-game success or by ponying up more cash to the publisher. Interestingly, within each episode, you’re able to play the levels in any order you wish. This is a refreshing change from many similarly-structured game, and allows you to move on if you should get stuck. While the gameplay is solid, offering players the ability to strategically select which ball will be most effective and giving them the freedom to skip levels, the presentation is sorely lacking. 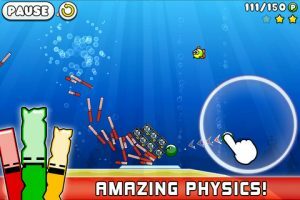 Looking at Angry Birds, which is the most successful game of this kind, and one of the most successful games in the last few years, one could argue that the game itself is only partially responsible for its remarkable fame. Toy stores are stocked with plush birds and pigs because the characters are charming and help make the game enjoyable. On the contrary, Blosics contains simple balls and blocks. True, they each have little faces, and the blocks make disgruntled sounds when they are hit. But beyond this minor characteristic, Blosics is terribly drab. I’m not suggesting that every game has to aspire to become mega-blockbuster status, Angry Birds style. But when your game is so derivative in nearly every way, it might serve you well to go the extra mile in an attempt to make it stand out. Bottom Line: Blosics is a solid and enjoyable game, despite its lack of originality and personality. Blosics is compatible with iPhone, iPod touch, and iPad. Requires iOS 3.1 or later.